Bang! The Bullet! is the deluxe version of Bang! and its expansions. Please note: The Bullet is made of thin tin and is easily dented. I often receive copies of the game with minor dings and dents on it from the distributor. The distributor states that this is expected and normal and they will no longer replace items with minor dings on it. I inspect every item I receive and if any copy is severely dented, I will list it as a ding & dent sale. However, items with slight imperfections may still be sold as new in this listing. If you have any questions regarding this, please contact me before making your purchase. 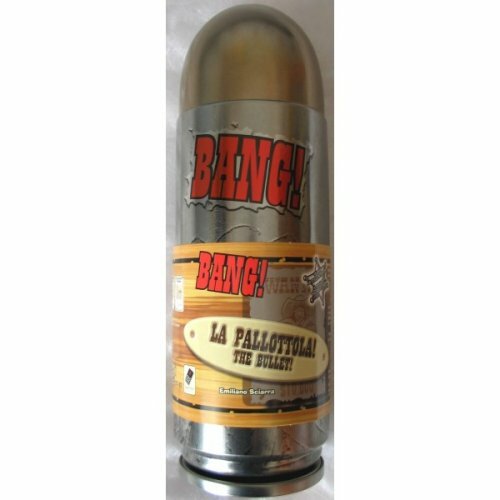 Also note that there are no purely English version of Bang! The Bullet. This version is both English and Italian, making it a real Spaghetti Western! Two new exclusive High Noon cards - "New Identity" and "Handcuffs"
Three new characters - "Uncle Will", "Johnny Kisch", and "Santa Claus"
Note: This expansion requires the Bang! core game in order to play. Bang! 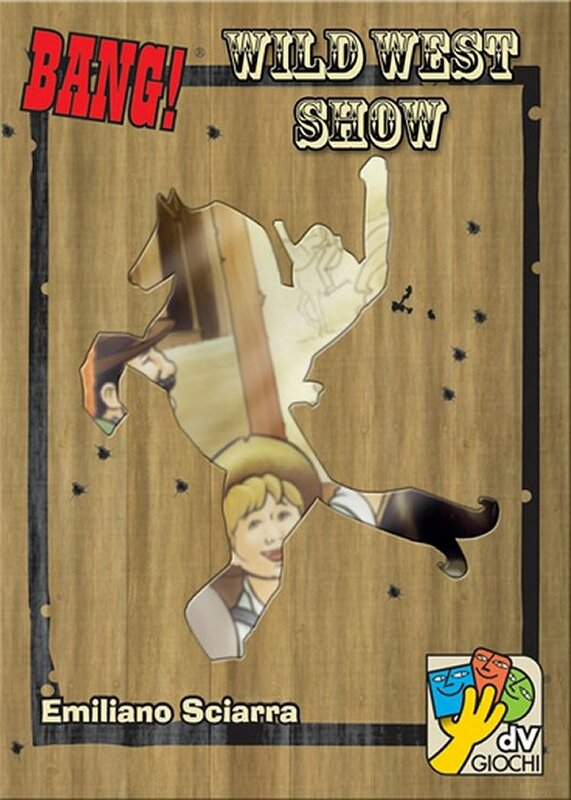 Wild West Show is "a little double-faced expansion that contains eight VERY wild new characters, like one that draws cards from the other players hands instead of the deck, one with 9 life points who cannot use Missed! cards, [and] one that "draws" when it’s killed and stays alive if you do not draw Spades, ’cause you need a Spade to bury him!, [plus] a set of cards that come in play when you play a Wells Fargo and change the rules of the game until they are discarded... [and] craaaaazy cards, like the Wild West Show that lets you play Missed! 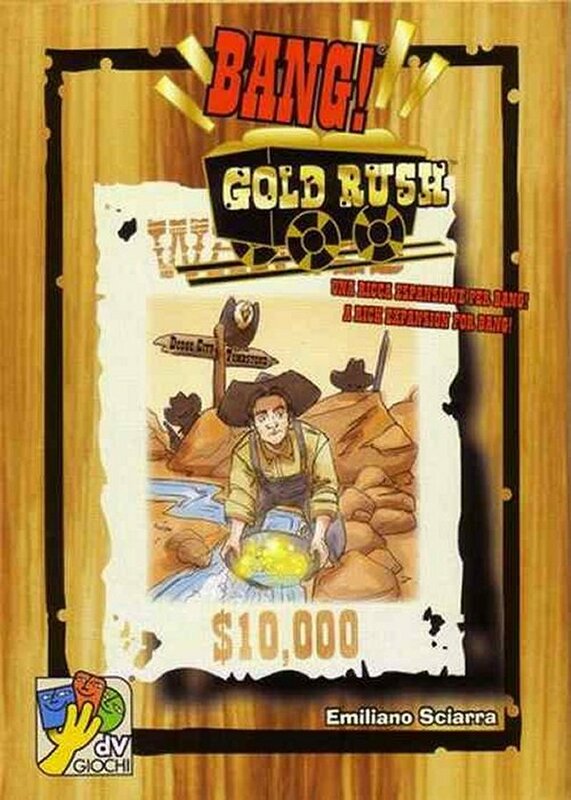 cards as BANG!s and vice versa, [and] one that lets you swap your position with another player at the table..."
It's Gold Rush time! A cascade of gold nuggets will be the reward for the quickest gunslinger. Now you can gain new and extraordinary equipment to help you during a gunfight. But watch out for the ghastly shadow-gunslingers...they have only one single aim: to blow you away! Can you gallop your way to the richest creek? A rich expansion for the world's best-selling wild west game! BANG! Armed & Dangerous holds many surprises for players of the BANG! card game: deadly weapons, powerful gear, and lethal ammo — which are all Dangerous cards. During the game, you can add load tokens to your Dangerous cards and your character, which you can use to activate your Dangerous cards, use the abilities of some characters, or upgrade the effects of some brown-bordered cards! To reload a Dangerous card, you have to play a blue-bordered card or discard a card from your hand at the end of your turn. Then it will be ready to unleash on your rivals! This expansion also includes eight new skillful gunslingers. 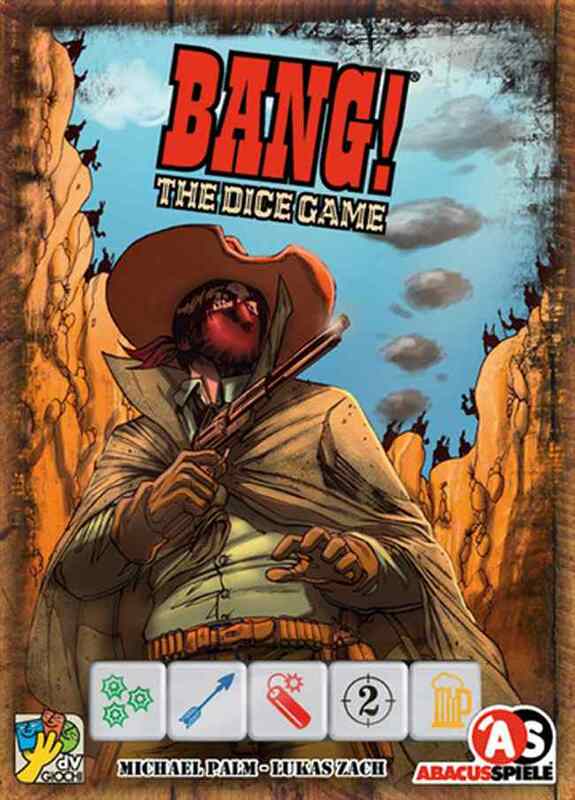 Watch a Video Review of Bang!